San Diego was the epicenter of the California gubernatorial campaign on Friday as both Lt. Gov. Gavin Newsom and John Cox arrived in their buses for political events. Newsom, a Democrat, ended his two-month bus tour of the state with a rally at San Diego State University. 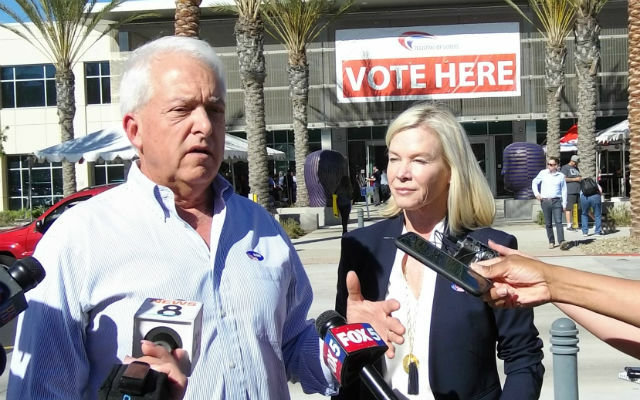 Republican challenger Cox and his wife Sarah dropped off their completed ballots at the San Diego County Registrar of Voters and met with the press before heading to a campaign event in Carlsbad. “I would be absolutely great for this region to have a San Diego governor,” said Cox, noting that Pete Wilson was the last governor from the county. Cox, a successful businessman who ran unsuccessfully for political office in Illinois before moving to Rancho Santa Fe, repeated the themes of his campaign: making it easier to build new housing and repealing the gas tax increase. Newsom, a California State University trustee, held his rally with the California Faculty Association in a student dining hall. He promised a positive alternative to Republican programs and policies. SDSU associate professor Charles Toombs praised Newsom for supporting higher education in the state. “Gavin Newsom wants to expand access to the CSU, and limit tuition hikes for students while continuing the state’s reinvestment in the CSU system to ensure faculty have the tools and time to deliver a high quality public education,” Toombs said. Newsom has a strong lead in the polls with the election just four days away. An average of recent polling by RealClearPolitics shows Newsom 16.5 percentage points ahead of Cox.